A Bright & Shiny New Year Ahead! Want one? Of course, we print our own calendars so this year, we wanted to change the way you think and feel about calendars by creating a unique design that truly REFLECTS our printing quality 365 days a year. Our 2017 calendar is printed on Krystal Krome, a blackout film designed for appliance surfaces and glass. Krystal Krome is a one-sided mirror-like surface that provides superior print performance. 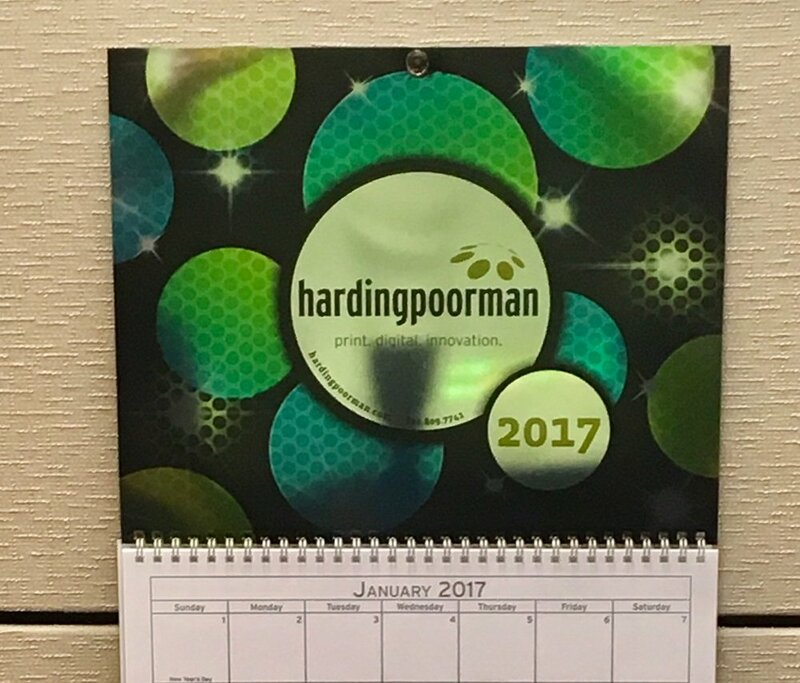 We're forecasting a bright and shiny 2017 so we wanted our calendar to reflect our outlook. Want one? Just sign up for our Newsletter HERE and we'll send you a BRIGHT & SHINY 2017! HardingPoorman and Canon Solutions America have a powerful connection! The Indianapolis Motor Speedway trusts HardingPoorman with the production of Indy 500 credentials. What's the best way to design event signage? Beyond a great reason to attend an event, signs are one of the first things your audience will need. Unfortunately in most cases, they are also one of the lowest priority items for an event planner. As a result, they can look like an afterthought, fail to communicate effectively, and poorly represent your brand. Less is More – People are lazy, especially customers. Make their life as easy as possible. Messy collages and text-heavy signs require the reader to think and process. Instead, simplify your signs and tell it to them straight. Quick Reads & In-Depth Thoughts Both Have Their Place – Sometimes, it just takes a little bit longer to deliver a thought. When this is the case, you want to make sure you share it with your customers at the appropriate time and in the appropriate space. Typically events are made up of a series of pathways and waiting areas. Reserve the signs with your in-depth thoughts for waiting areas. If you place them in pathways you run the risk of both clogging traffic and missing your audience. Instead, place quick concise thoughts in the spaces where you don’t want your customers to linger. A Picture’s Worth A Thousand Words – This is a cliche for a reason. A well-selected picture or well-designed graphic can deliver a message in the blink of an eye. When it comes to large-format printing, all of these factors need to be consistent. Consider Your Signs’ Placement – Signs on the ceiling and floor might be fun and different, but they are rarely effective because they are harder to see. You want to place your signs along your guests' natural sightlines to keep them from the frustration of searching for directions. As you consider your large-format printing needs, think about how your signs will be placed. Will they hang from the ceiling? Are they going to be attached to a wall? All of these factors should be taken into account to ensure you can hang your signs properly and where you want them. Vary Your Shapes and Sizes – Odd things catch your audience’s attention. Things that are different stand out. Use this to your advantage. By varying your shapes and sizes when you are doing large-format printing, you can keep your audience’s eyes moving and attract them. Easy to Read Font Colors – Easy-to-read font does not have to be black, but it is typically dark and it definitely needs to have a high contrast to its background. Using two different similar tones makes it hard for the eye to distinguish the letters.